Can I ask if anybody out here has ideas for whatever technique is used to make halfway style shirts? As in, rather than going all the way down, they stop midway somewhere in the chest. Can anyone tell me the methodology making the opening stop halfway at the waist line but the fabric below it is still one whole piece? P.S. I can easily sew up a regular shirt with the opening going straight down; I just stump here. Edited by Talon247, 09 November 2017 - 05:20 PM. Cut the front whole and, slit the front and proceed from there - you have the placket to stop any fraying. 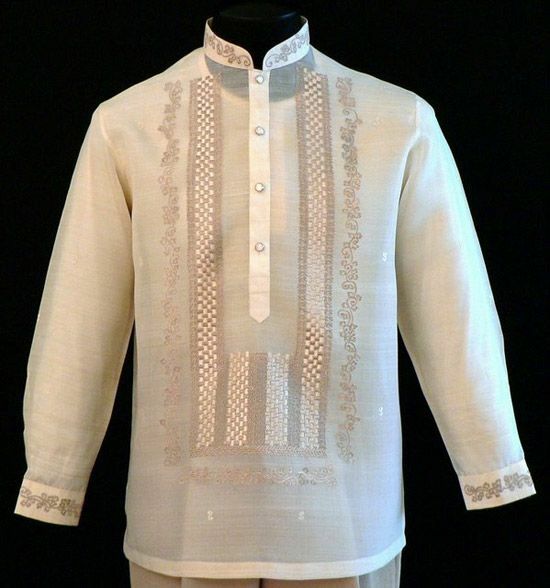 Both of your examples are made exactly like a sleeve slash/ sleeve placket of a traditional shirt. There are tons of how to´s on youtube. Well.... any ideas for what is the proper term for this kind of shirt? I searched "half way shirt" on Youtube but only found tutorials on how to convert a T-shirt to a crop top. I call that a tunic, rather than a half open shirt. Would be helpful if you send me a visual medium how to make a tunic style dress shirt. Searching "mens tunic shirt" only gave pseudo-Nordic style T-shirts in Google. Edited by Talon247, 09 November 2017 - 09:50 PM. Unfortunately the images are not accessible on the website. Edited by Schneiderfrei, 09 November 2017 - 10:21 PM. I would call it a pull over shirt with front placket opening. It is quite easy to turn a normal shirt pattern into such style. Use a normal shirt front pattern, find out the centre front line (normally the line where button hole would be made), and change it into a fold line so that both right front pattern and left front pattern would be cut in one piece. Determine how deep the placket go and then sew in the front middle placket opening using similar method as the shirt sleeve placket. that is a very good way. Sometimes the placket is developed into a single fold at the front so a bit extra is added to the centre front to account for this. The placket used to be constructed with an inlay to add stiffness, though I doubt that this is essential these days. Frankly speaking, I do have doubt on the effectiveness of these inlay, especially we don't have much choice of good interlinings with reasonable prices. I recalled that when I made a shirt project many years ago, my sample garment was completely ruined by a wrong selection of cheap fusible interlining. After a few washes, the inlay not only added stiffness to the main fabric, it also added numerous creases and wrinkles at no additional cost! For me, an inlay is essential, other way you do not have enough body for the buttonholes and you want it crisp and clean and it should hold its form. What you choose - ironed or not ironed in - is up to you, you have to do samples if you do not know how it react with the fabric. You can use the shirt fabric as inlay too. It is more work of course. This is a bit more complicated. The directions do not hold one's hands. The fittings, if I remember correctly, don't have exact measurements. The front is cut on the fold. This is for the tucked pleat. But, the directions can be adapted to flat front or normal two piece front, of which there are several kinds. Interlinings can be taken from scraps of other shirts. White is usually the best for Interlinings. Weight of Interlinings can be lighter, or heavier. Heavy duty shirts the Interlinings can even be as heavy as coat canvas. Some kinds of fuse needs to be gotten wet and hung up to partly dry before applied. Non-fuse means that you never have to worry about fuse problems. Tailors have used scraps for hundreds of years. Click on the pictures, click save. Wait until they show up. Does clicking on them again give a better picture? I appreciate posaune's comment. I have not made many shirts in this style. I have been learning how to be more and more light on the centre front overlap. But for a tunic you might very well do better with an inlay.